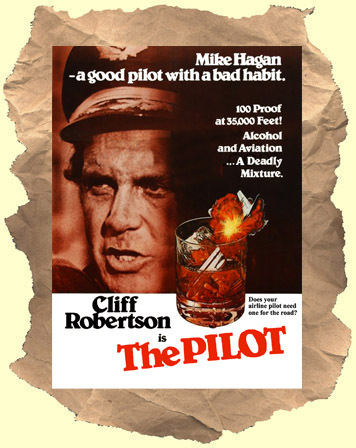 SYNOPSIS: Cliff Robertson stars as a first rate airline pilot who also happens to be an alcoholic. This is a simple but effective drama with Cliff Robertson at the top of his game (directing too!). He's in almost every scene as the brilliant but flawed pilot Mike Hagen. His marriage is near it's end, he has a girlfriend (Diane Baker) in San Francisco and all he cares about is his daughter, flying planes and...drinking. The catch is that he's great at his job. There are some tense scenes of Mike troubleshooting from the cockpit as time and again his instincts prove right. These sequences make up the bulk of the film and are done in a realistic manner that somehow manages to overcome the trap of cheesy disaster films like Airport, etc. Eventually Mike realizes that his drinking is a real problem and seeks help from a quirky psychiatrist (Milo O'Shea). A recommended film that has remained out of print on video for 25+ years and has seen no dvd release anywhere in the world!